She is now receiving treatment at a hospital in Galway. The following is an account of Keith Duggan’s interview with her in jail last month (for the Irish Times). D’Arcy is 79. As well as being an activist, she is an actor, writer and member of Aosdana. On October 7th, 2012, she walked on to the runway at Shannon Airport with Niall Farrell, of the Galway Alliance Against War group, to protest against the airport’s use by the US military. She was subsequently found guilty of illegal incursion on a runway and given a suspended sentence of three months. And there it might have ended. But D’Arcy refused to sign a bond committing her to uphold the law and to stay away from unauthorised zones at Shannon. This led, last month, to her early-morning arrest at her home, on St Mary’s Terrace in Galway city, and her transfer to jail. From a legal perspective this is inarguable. But her sentence has split public opinion. Some see it as an inevitable punishment for breaking a law and, arguably, endangering the public. Others believe that, in a country where moral and financial scandals have gone unchecked, it is shameful to imprison an elderly woman who has demonstrated unwavering moral courage in committing to a selfless cause. Some say she should be pardoned. On the day of my visit, a week ago, D’Arcy wears white trainers, grey tracksuit bottoms, a matching hoodie and a raincoat, and her hair is tied back. A small wooden partition separates visitors from inmates. She peers at her guests - myself, and Zoe Lawlor and John Lannon of Shannonwatch - through round-rimmed spectacles. Other visitors have included Sabina Higgins, the wife of President Michael D Higgins. Even in the casual clothes D’Arcy has something of the society hostess about her. She talks not as a helpless prisoner but as though she wants to make a personal project of improving the place, a classically bleak mausoleum on Mulgrave Road that has served as a lock-up for almost 200 years. She stands rather than sits at the bench and trades information with her Shanonwatch colleagues. She answers questions about her wellbeing but is more animated when discussing the shortcomings of life in Limerick prison. “It’s the sensory deprivation that is shocking. Not getting to see the moon, the stars. That is terrible for people in here. There is nothing to do. In Holloway Prison, for example” - she spent time there in the 1980s, during the Greenham Common anti-nuclear protests in the UK - “the library was well stocked and the recreation room had things to do. Here, when you are out for exercise, it is just as you see in the films, with people walking around in circles. Surprisingly, she fully agrees with Shatter about one aspect of her case. In his terse response to the moral question of imprisoning a pensioner who is being treated for cancer, he said that age cannot be a consideration. D’Arcy expresses a similar view. “A person’s age is not relevant when it comes to taking a stand,” she says in her rushed, sweeping way. “I may well have fewer commitments to family now than a younger person would, and this gives me the opportunity - as well as the duty - to act. It’s important to realise that people can be effective regardless of age. And, you know, you have to follow something through. It’s no good having a big march and 100,000 people turning out and nothing more is done about it. The principle is important. D’Arcy and Farrell say they occupied the runway at a time when no flights were scheduled to land. The court heard that two delayed passenger flights had to go into a holding pattern because of the disruption. D’Arcy’s absolutism and sense of certainty seem unusual at a time when pragmatism and ambivalence define so much of our politics. She is a daughter of the turbulence of the 20th century. Her father, Joseph, was a tenement child from Henrietta Street in Dublin and was active in the IRA during the War of Independence. He later met Miriam Billig, a Jewish Londoner whose parents had fled Odessa, when they were both finding their way in London. Neither parent would ever elaborate on their exotic backgrounds. “They would be scornful and dismissive of my attempts to explain them: they’d say it was rubbish,” D’Arcy wrote in Loose Theatre, a baggy and slyly humorous memoir of her hectic life, which she published in 2005. D’Arcy was born in 1934. As children she and her sisters learned to avoid using the word “nice” at the dinner table, as it was enough to set their father off. He was by nature reserved, but something about the word, she later understood, infuriated him. “It was a red rag to a bull; he associated it with the self-effacing Catholic gentility, which he abhorred,” she recalled in Loose Theatre. In her adolescence D’Arcy moved between the “treacherous forest” of Ireland and England. She immersed herself in theatre and met the Barnsley playwright John Arden, author of Serjeant Musgrave’s Dance. The pair married in 1957 and responded instinctively to the social and political issues of their time. She became a parent herself, and her four boys lived in London, in India and on an island in Lough Corrib before they were through their teens. They saw their mother imprisoned in Shillong Jail, in northeast India, and, later, in Armagh for refusing to pay a fine incurred during a republican rally. During the Greenham Common women’s peace camp, which existed from 1981 to 1990, she spent two days in solitary confinement at Holloway Prison for refusing to adhere to the strip-search policy. D’Arcy’s son Finn Arden, who now lives in Galway, has observed his mother’s activism up close since early childhood. “She’s a very strong-minded person. She could have signed the bond, yes, but she would have seen that as an infringement on her right to protest against something she feels strongly about. For all of her life she has been against imperialist violence around the world. “I was probably hauled along to more rallies and propaganda films than I can remember,” Arden says of his formative years. On the Lough Corrib island, their home had no electricity and no phone line. A neighbour would shout messages from the mainland, and they cycled into Oughterard for groceries. “I sometimes wished for the childhood my friends had - homes with a television,” says Arden. Arden participated in the “occasional CND” march but says that none of the boys became involved in peace activism with the same passion as their parents. They worried about the violence, the emotional toll and the long absences, and spoke to her once or twice about easing off. “But it was pointless,” he says. He says D’Arcy managed to give up smoking only recently, and he is concerned that her time in Limerick Prison will cause her to take it up again. It is Arden who now tries to orchestrate the number of people wishing to visit her in prison. He also passes on good wishes in the six-minute daily phone call she is permitted. D’Arcy’s many visitors must go through a rigorous security system: photographic ID, pat down, mouth check, sniffer dog and X-ray machine. No pens or phones are permitted, and visitors are not allowed to wear scarves. A member of the prison staff sits in on the conversation. D’Arcy cheerfully says that some of the women she has befriended think she is bonkers for not signing the simple piece of paper that will get her out of there. But, a fortnight in, she has no intention of doing so. Instead she is organising. “Busy,” she says brightly when asked how her days pass. She has asked Lelia Doolan, the film producer and a longstanding friend, to persuade the bookshops in Galway to donate books for the prison library. She laughs a lot and sometimes talks about her situation as if it is a bit of a lark. She says the food in Limerick Prison is wonderful, as is her cellmate, a Hungarian woman who sings opera. D’Arcy herself is using her prison time to improve her tin whistle-playing. A musical collaboration between the cellmates would seem inevitable. 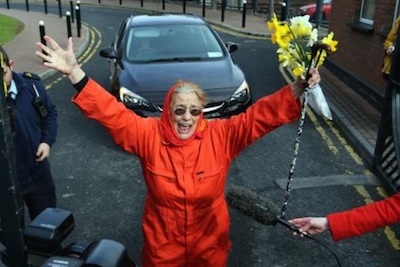 She admits to being pleased by the attention her imprisonment has generated and by the fact that it has highlighted the quiet, stubborn presence of the Shannon activists. If that leaves her open to the accusation that this is all a publicity stunt, then so be it.